tags: Out to totally save the world without breaking a nail! Totally Spies! Is a fast-paced, high energy half-hour action comedy show starring Clover, Alex and Sam, Three Beverly Hills teens who unwittingly become international secret agents. As secret spies, the girls must manage to combine their schoolgirls responsibilities (be it getting homework done on time or finding the right dress for Friday's dance) with their spy duties - battling with outlandish super-villains and basically saving the world - with style. "Totally Spies!" is a fast-paced and fun show that depicts 3 girlfriends 'with an attitude' who have to cope with their daily lives at high school as well as the unpredictable pressures of international espionage. Whether the girls are laying low on a secret island off the coast of Japan, on hands and knees deep within the sewers of Paris or crouched in the baggage hold of a private jet over the Bermudas, they confront the most intimidating - and demented - of villains, each with their own special agenda for demonic, global rude behavior! The three friends each use their specific talents to help save the world while stressing about next week's algebra final or finding a decent prom dress on time. 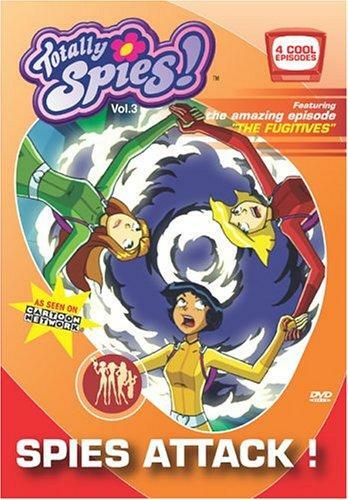 "Totally Spies" is a French-American/Canadian Action-Comedy-Cartoon produced by the French company Marathon Production. This anime-influenced cartoon series debuted on TV year 2001. This series can also be called as a "Charlie Angel's" rip-off mainly aimed to children. Again I give you a SPOILER WARNING!!! Just to make sure readers don't read some spoilers by accident. Welcome to Beverly Hills, and meet Sam, Clover and Alex. These girls might look like just your typical movie-schoolgirls, as much of their everyday life mostly are used on stuff like fashion, boys and getting plagued by their annoying rival Mandy. But in seconds they turn into super spies by getting "woohped" by their boss agent Jerry, the leader of WOOHP, a secret organization for agents and spies. They all get to know some "world problem", and get some spectacular gadgets which look like ordinary things like a pen, bubblegum, mascara, hair dryer, etc. And there they go to investigate this "problem" in any place on the Earth, get eventually caught by either the villain or the henchmen, and get loose in order to stop the villain. And this happens in every single episode, unless there is some part-2-and-3-episodes. This was one the series I often watched when I had Jetix on my cable-TV, this together with other series like "Pokemon", "Digimon" and "W.I.T.C.H." And then I say as good as too often, as I happened to watch several of the same episodes again and again. And please don't ask my why, but it simply happened when I still waited for new episodes to come up. However "Totally Spies" seemed to try to mimic the famous anime genre (Japanese animation) by using some of the typical "anime effects", but somehow fails to do it. The girls in the series might look cute, but sometimes get somewhat annoying; Alex tend to say some random joke which isn't funny at once; Clover tend to get too obsessed with fashion and boys sometimes...I can go on in all eternity if I wanted, but I don't think so. Yes, I have watched too much "Totally Spies" for years ago, but decided to drop the fifth season and so on, because I have better things to watch than this. If anybody is interested, season 6 have already debuted in France and Netherlands summer 2013. So I think the fans of this series can have something to look forward to. ;-) Totally Spies was a bit like a Charlie's Angels animated series. Except this is with teenage girls. The show Totally Spies features three girlfriends that fight crime and wear the latest fashion. Sam, Clover and Alex (Oldest to youngest in that order), are just trying to fit in as normal teenagers at Beverly high. Until they get turned into secret WOOHP agents! To make their life's any harder, Mandy (school foe), is always on their back never-the-less along with homework and boys! This show was on ABC Family for Season 1 in November 2001 - June 2002 and then after Season 1 was over ABC Family dropped the show and then July 2003, Cartoon Network picked up the show and renewed the show for a Season 2 and some more seasons! This is show is pretty cool and kind of funny.